Leks, display grounds where males congregate and females visit to copulate, are typically traditional in location, despite often high turnover of individual males. How leks can persist in face of male turnover is not well understood, in part due to a lack of detailed field data allowing for a clear understanding of lek dynamics. We followed the fate of individual males at 11 to 15 leks of the blue-crowned manakin Lepidothrix coronata across four breeding seasons to gain insights on how leks are formed and changed in space and time. Between years, leks were traditional in location despite changes in territory ownership due to male disappearance and recruitment. New males were equally likely to recruit by taking over existing territories or by establishing new territories. Recruitment was influenced by age, as recruits were more likely to be adults than subadults. 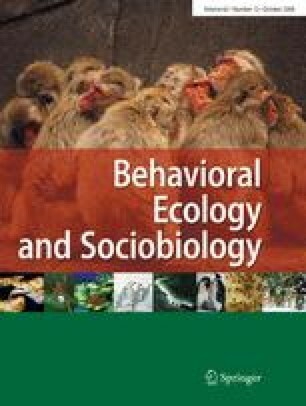 Lek size did not affect the probabilities of a male recruiting or persisting at a territory, and vocalization rate, a correlate of mating success in this population, did not affect male persistence. We used our field data to model changes in lek size and composition over longer periods of time (100 years) to understand how lek traditionality can be reconciled with high male turnover. Our simulations showed that leks in our population rapidly stabilize in size despite changes in territory ownership and that rates of male recruitment and disappearance compensate each other, such that leks have the potential to persist for several decades after the original males have disappeared from them. We thank David and Consuelo Romo, Kelly Swing, Jaime Guerra, and all the staff at TBS for making possible our research in Ecuador. We worked under permission no. 13-IC-FAU-DFN granted by the Ministry of the Environment of Ecuador and Animal Care Protocol no. 5-12-20 issued by University of Missouri—St. Louis. We thank all who helped in data collection, in particular Ken Hiser, Bart Kensinger, José Hidalgo, Franklin Narvaes, Thomas B. Ryder, Wendy Tori, and José Grefa. This work was funded by National Science Foundation (IBN-0235141, DEB-0304909), National Geographic Society (7113-01), University of Missouri—St. Louis, International Center for Tropical Ecology, and Idea Wild. RD was supported by doctoral fellowships from CAPES (Fundação Coordenação de Aperfeiçoamento de Pessoal de Nível Superior, Brazil) and UM—St. Louis. We give special thanks to our collaborator Patricia Parker and to Jack W. Bradbury, Jordan Karubian, Ivan Jimenez, Robert Ricklefs, Robert M. Gibson, and two anonymous reviewers for fruitful discussions and valuable comments on earlier versions of this manuscript.